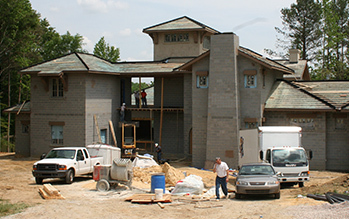 Bost Custom Homes has been a leader in residential concrete masonry construction since pioneering the technique in the Triangle Area in 1999. When Rex Bost began masonry framing it was considered a bold choice in a softwood region where wood framing is the prevalent selection for most residential construction projects, but the advantages of the masonry technique, especially given the recent Hurricane activity that the Triangle had endured were too great to not take action. Over the years Bost has honed and improved an exclusive masonry framing technique to make a process that is advantageous, versatile, and affordable. 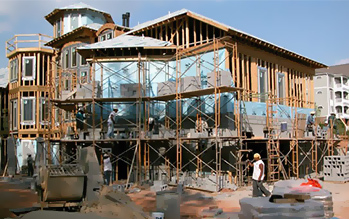 THE PROCESS: Masonry Framing is a process in which the exterior walls of the home are constructed with concrete masonry units or CMUs, very similar to many commercial buildings. The concrete and steel walls are stronger than stick-built and become the load-bearing component vs. lumber walls. The interior walls are wood framed plus the exterior walls have a 2×4 wall added to allow for additional insulation, wiring and plumbing. Interior finishes are allowed the same creative freedom as those on any other framed home, exteriors may be covered with stone, brick, siding or stucco. The question remains; what really makes masonry framing better than traditional framing techniques and how has Bost improved masonry framing further? ADVANTAGES: Encasing a home in concrete block creates a stronger and tighter building envelope than traditional stick framing, thereby increasing energy efficiency. Thermal massing holds heat in longer in the winter and keeps the home cooler in the summer. Concrete masonry wall construction also creates a quieter home; absorbing much more sound energy. The sheer mass and weight of the concrete masonry walls reduces sound penetration through the wall by over 80 percent when compared to wood-frame construction. CMUs are the answer for homeowners looking to increase energy efficiency as well as provide protection from weather, rot, fire and environmental damage. 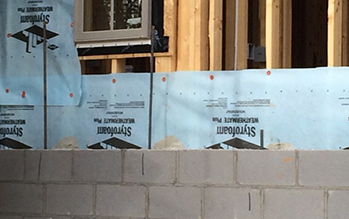 Bost has strived to keep the cost of masonry framing low. Currently the average difference is a about 3% above that of a conventional wood framed, brick home. Rex grew up working with his father, a masonry contractor and later started his own masonry company. It was this experience that helped him develop solutions to the challenges that masonry framing creates for conventional builders. 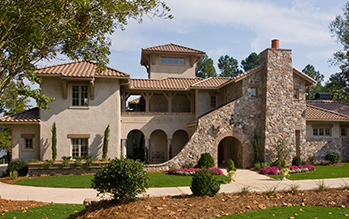 Through creative design, Masonry Framed homes can look like any other without limitation to any architectural style.